6:08PM. #4 was perching in the nest-box entrance, and got a food delivery (probably from the male parent). The food-begging rasps of the other fledglings can be heard, high over our driveway, and Connie spotted some silhouettes making short flights and flapping wings, high up in the hackberry tree where she spotted #1 and #2 yesterday. It will be interesting to see if #3 has already managed to join them. Morning update: The answer to the last question was, Yes. All three of the fledglings are now gathered close together in the hackberry tree south of the nest box. If #4 owlet manages to join them tonight, we expect the whole family grouping to start drifting farther away from this location. 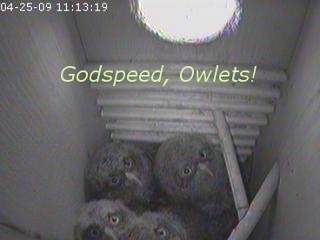 Last year, the owlets and parents drifted a block westward in the first week after fledging. We were able to locate them during evening walks by the sound of their rasping “feed me!” calls. 8:08PM; Three of us watched here on Euclid St. and two of us watched online from Methodist Hospital as the last owlet, little Reluctant, a.k.a. #4, took the intrepid trip out the entrance hole. On the cam, he was just visible beyond the box entrance for a minute or so. Observers outside on the driveway were holding their collective breaths as #4 struggled with the climb up the steep part of the “walkaway branch”. It took him about three tries, punctuated by a flapping fall of several feet into thick branches, before he managed to finally make it onto the top of the big oak limb. Meanwhile, we saw silhouettes of the three, earlier fledglings and the two parents flitting from branch to branch high overhead in the hackberry. When Connie returned home at 10pm, she noted that the fledglings had already moved from the hackberry, into the live oak above our roof. Kudos to Madame and Monsieur Owl for successfully getting four owlets to this point. At midnight, Connie noted that the fledglings seem to have moved back into the hackberry, perhaps to absorb #4 into the family group.